The Cisco 3800 Series of Integrated Services Routers extends Cisco Systems' leadership in multiservice routing, providing customers with unparalleled network agility, performance, and intelligence. By transparently integrating advanced technologies, adaptive services, and secure enterprise communications into a single, resilient system, the Cisco 3800 Series routers ease deployment and management, lower network cost and complexity, and provide unmatched investment protection. 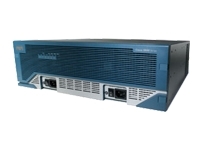 The Cisco 3800 Series routers feature embedded security processing, significant performance and memory enhancements, and new high-density interfaces that deliver the performance, availability, and reliability required for scaling mission-critical security, IP telephony, business video, network analysis, and Web applications in the most demanding enterprise environments. Built for performance, the Cisco 3800 Series routers deliver multiple concurrent services at wire-speed T3/E3 rates.